What Is Citigroup Hiding From Its Shareholders Now? In the early and mid-2000s, Citigroup had compensation practices that can fairly be described as a disaster for shareholders (and for the broader economy). Top executives, such as then-CEO Chuck Prince, received big bonuses and generous stock options. Lower level managers and traders were paid along similar lines. These incentives encouraged Citi employees to take risks and boost profits. Unfortunately for shareholders, the profits proved largely illusory – when the dangers around housing and derivatives materialized fully, the consequences almost destroyed the firm. The market value of Citigroup’s stock dropped from $277 billion in late 2006 to under $6 billion in early 2009. The shareholders could easily have been wiped out – they were saved from oblivion by a generous series of bailouts provided by the federal government (see Figure 7 in the final report of the Congressional Oversight Panel; direct TARP assistance was $50 billion but “total federal exposure” was close to $500 billion). In the next credit cycle, the experience for Citi shareholders could be even worse. So it is entirely reasonable for shareholders to look carefully at, among other things, the details of how executives and other key employees are paid – and to understand the current incentives for taking and managing risk. Citigroup is a very large bank that has amassed a huge amount of political power. Its current and former executives consistently push laws and regulations in the direction of allowing Citi and other megabanks to take on more risk, particularly in the form of complex highly leveraged bets. Taking these risks allows the executives and traders to get a lot of upside compensation in the form of bonuses when things go well – while the downside losses, when they materialize, become the taxpayer’s problem. Citigroup is also, collectively, stupid on a grand scale. 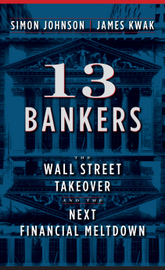 The supposedly smart people at the helm of Citi in the mid-2000s ran them hard around – and to the edge of bankruptcy. A series of unprecedented massive government bailouts was required in 2000-09 – and still the collateral damage to the economy has proved enormous. Give enough clever people the wrong incentives and they will destroy anything. Just a few short days ago, it looked like Citigroup was on the ropes. The company’s proposal for redistributing capital back to shareholders was rejected by the Board of Governors of the Federal Reserve System. Given the global bank’s repeated fiascos – including most recently the theft of around $400 million from its Mexican unit – it is hardly surprising that the Fed has said “no” (and for the second time in three years). The idea that Citigroup might now or soon have a viable “living will” now seems preposterous. If top management cannot run sensible financial projections (that’s the Fed’s view; see p.7 of the full report), what is the chance that they can lay out a plausible plan to explain how the company, operating in more than 100 countries worldwide, could be wound down through bankruptcy – without any financial assistance from the government? According to the Dodd-Frank financial reform law, failure to submit a viable living will should result in remedial action by the authorities. Before 2006, people used to talk about the Greenspan put: the idea that, should the going get rough in the markets, Chairman Al would bail everybody out. But there’s something even better than having the Federal Reserve watching your back. It’s the résumé put. The Wall Street Journal reported that Vikram Pandit, former CEO of Citigroup, is starting a new firm called TGG which will . . . well, it’s not entirely clear. In one email, they claim “a novel approach to address the challenges that large complex organizations face in compliance, fraud, corruption, and culture and reputation.” (That’s the standard marketing tactic of describing what benefits you will provide without mentioning what you actually do.) Now, Pandit certainly has experience in a large, complex organization with compliance, fraud, corruption, culture, and reputation problems. Citigroup checks pretty much every box. But is it experience you would want to pay for? “All You Need for a Financial Crisis . . .
That’s a saying that someone, probably Simon, repeated to me a few years ago. Crash of 1929, Latin American debt crisis, early 1990s real estate crash (OK, that wasn’t a financial crisis, just a crisis for Citibank), Asian financial crisis of 1997–1998, and, of course, the biggie of 2007–2009: anywhere you look, there’s Citi. Sometimes they’re just in the middle of the profit-seeking pack, but sometimes they play a leading role: for example, the Citicorp-Travelers merger was the final nail in the coffin of the Glass-Steagall Act and the immediate motivation for Gramm-Leach-Bliley. Citigroup is also the poster child for one of the key problems with our megabanks: the fact that they are too big to manage and, on top of that, the usual mechanisms that are supposed to ensure half-decent management don’t work. Around 2009, if you were to describe the leading characters in the TBTF parade, they were JPMorgan, the last man standing (not so much anymore); Goldman, the sharks who bet on the collapse; Bank of America, the ego-driven empire-builder; and Citi, the incompetent (“I’m still dancing”) fools. On Thursday of last week, four senators unveiled the 21st Century Glass-Steagall Act. The pushback from people representing the megabanks was immediate but also completely lame – the weakness of their arguments against the proposed legislation is a major reason to think that this reform idea will ultimately prevail. The strangest argument against the Act is that it would not have prevented the financial crisis of 2007-08. This completely ignores the central role played by Citigroup. What Good Is the SEC? This week’s Atlantic column is my somewhat belated response to Judge Jed Rakoff’s latest SEC takedown, this time rejecting a proposed settlement with Citigroup over a CDO-squared that the bank’s structuring desk created solely so that its trading desk could short it. I think Rakoff has identified the heart of the issue (the SEC’s settlements are unlikely to change bank behavior, so what’s the point?) but he’s really pointing to a problem that someone else is going to have to fix: we need either a stronger SEC or stronger laws. I’d like to see an aggressive, powerful SEC that can deter banks from breaking the law, but we don’t have one now.